Download digitally archived Bally Arcade tape programs that will load with AstroBASIC (the BASIC with the built-in tape-interface). $ Graph (Lesson Version) "$ Graph (Lesson Version)"
Astro BASIC Manual, Pg. 37. Bally BASIC Manual, Pg. 52. 256 Color Display "256 Color Display"
";GOTO 500" was added to the end of this program in 1982 version of Astro BASIC Manual, causing the last loop to repeat forever! "300 Baud to 2000 Baud Tape Conversion Program"
"Array Builder" - Used to input and then save the "300 Baud to 2000 Baud Tape Conversion Program" to tape. To use the Conversion Program, it is not necessary to use the "Array Builder" at all. "Array Builder" is included archive purposes only. Note: The screenshot of this program is not "garbled," nor is it full of garbage. 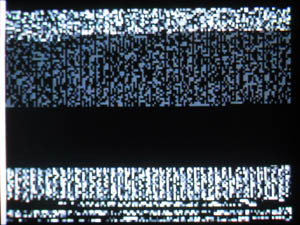 This is what the working program looks like after a 300-baud program has been properly loaded. At the moment this screenshot was taken, the program was is in the process of converting the BASIC program from screen memory to the memory setup that "AstroBASIC" uses to store its own program. Bally BASIC Manual, 100 and 101. Anti-Aircraft Gun (Modified) "Anti-Aircraft Gun (Modified)"
Astro BASIC Manual, Pg. 78. Bally BASIC Manual, Pg. 107. Astro BASIC Manual, Pg. 82. Bally BASIC Manual, Pg. 112. Astro BASIC Manual, Pg. 23. Bally BASIC Manual, Pg. 28-29. Astro BASIC Manual, Pg. 67. Astro BASIC Manual, Pg. 25. Bally BASIC Manual, Pg. 32. Bally BASIC Manual, Pg. 118. Astro BASIC Manual, Pg. 75. Bally BASIC Manual, Pg. 103. Astro BASIC Manual, Pg. 65. Bally BASIC Manual, Pg. 97. Bally BASIC Manual, Pg. 113. Composition in A-Z "Composition in A-Z"
Astro BASIC Manual, Pg. 76. Bally BASIC Manual, Pg. 104. Composition in F "Composition in F"
Astro BASIC Manual, Pg. 77. Bally BASIC Manual, Pg. 105. Composition in L "Composition in L"
Astro BASIC Manual, Pg. 81. Bally BASIC Manual, Pg. 111. Count the Boxes "Count the Boxes"
Astro BASIC Manual, Pg. 96-97. Decimal to Hex Converter "Decimal to Hex Converter"
Astro BASIC Manual, Pg. 97. Draw (Lesson Version) "Draw (Lesson Version)"
Astro BASIC Manual, Pg. 55. Bally BASIC Manual, Pg. 79-80. Astro BASIC Manual, Pg. 80. Bally BASIC Manual, Pg. 109. Astro BASIC Manual, Pg. 46-47. Bally BASIC Manual, Pg. 64-68. Astro BASIC Manual, Pg. 45. Bally BASIC Manual, Pg. 62. Astro BASIC Manual, Pg. 83. Bally BASIC Manual, Pg. 114. Astro BASIC Manual, Pg. 86. Bally BASIC Manual, Pg. 120. Astro BASIC Manual, Pg. 51-52. Bally BASIC Manual, Pg. 74-76. Astro BASIC Manual, Pg. 79. Bally BASIC Manual, Pg. 108. Bally BASIC Manual, Pg. 121. Astro BASIC Manual, Pg. 39. Astro BASIC Manual, Pg. 34. Astro BASIC Manual, Pg. 40-43. Bally BASIC Manual, Pg. 55-59.